We strive to impress you, not just to meet your Xpectations. 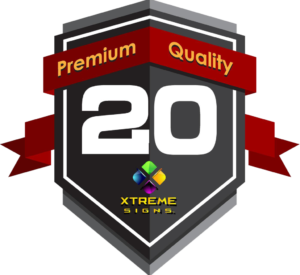 For the last 20 years XTREME SIGNS has been providing clients with the highest quality designs on the best materials, making us an industry leader for years. We’re all about quality and that is obvious in all our work. Why should you choose to use XTREME SIGNS? Serving the Salinas, Monterey, Santa Cruz, Watsonville and Bay Area, California, Xtreme Signs is family owned and operated with over 20 years in the custom signs and design. We know how busy business can get, but we also know how to make it easier. With a staff that takes personal ownership in meeting the unique and specific needs of each project, we proudly continue to serve our clients with professionalism and awesome custom designs. Rely on one company, one resource and one phone call from Xtreme Signs.